Like canaries in a coal mine filling with methane, the few remaining afternoon newspapers in competitive metro markets are gasping their last. :: The presses were silenced forever on New Year’s Eve at the Cincinnati Post (last reported circulation 42,000). :: The Madison Capital Times (circulation 17,000) announced today that it will be cut to a two-day-a-week insert in the Wisconsin State Journal. :: The historic Albuquerque Tribune (circulation 11,000) is living on borrowed time after plans to sell it to local businessmen evidently fell through. For all that ails newspapers – and there is quite a lot – afternoon newspapers in competitive markets have been feeling the industry’s pain even more acutely than AM titles for more than 25 years. And there is nothing to suggest anything is going to reverse that. It wasn’t always so. In the post-World War II period, the number of afternoon papers in the United States hit an all-time high of 1,453 in 1948 vs. only 328 morning properties in the same year, according to the Newspaper Association of America. At the end of 2006, by contrast, there were 833 morning and 614 afternoon papers, representing a decline of 344 publications. You may be surprised to learn (as I was) that afternoon papers outnumbered morning papers in as recently as 1999, when 736 titles were printed on the morning cycle and 760 papers came off the press in the afternoon. But changing demographics, shifting commuting patterns and upstart media like TV (trends discussed more thoroughly here) have been whacking afternoon circulation since 1980 at a far more furious rate than experienced by morning papers. As you can see from the chart below, a 7% decline in the average circulation of afternoon newspapers between 1970 and 1980 rose to an 18% drop in average circulation in between 1970 and 1980 and snowballed to a 36% plunge in average circulation in the 10-year period ended in 1990. 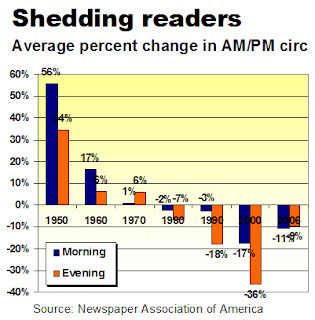 While the average circulation of morning papers also began eroding in 1980, the decline was more moderate than the loss at PM titles until 2006. As afternoon newspapers became increasingly unpopular among consumers, many publishers operating in single-paper towns migrated their production to the morning cycle. That’s one reason why the number of morning papers has overtaken the number of afternoon titles. But there is no room for a second morning paper in a competitive market dominated by an incumbent AM property. And that leaves PMs in competitive markets with no place to go. The owners of the Cincinnati, Madison and Albuquerque newspapers have an additional incentive to either downsize or forsake their franchises. Scripps, the owner of the afternoon titles in both Cincinnati and Albuquerque, is a partner in each market in a joint-operating agreement with the owner of the morning paper. When the cost of propping up each weakened afternoon paper is stripped away, there will be financial benefits for both Scripps and the publishers of the surviving morning titles. With the economic pressures on the industry likely to mount for the forseeable future, it appears we are about to see a growing number of obituaries for PM papers, a feisty breed whose better days, unfortunately, are behind them. Just curious. Does anyone know of any PM newspapers that are stable or are growing. It might be useful to see if there are any anomilies to better understand what's possible. My impression is that free newspapers and neighborhood newspapers are actually doing ok. If anyone can confirm or contradict that might be an interesting thing to look at. This brings to mind the Long Island Press, the paper of my youth that had at least as much influence on me as another certain New York paper and which, @michael josefowicz, is still alive and kicking, at least. Maybe the problem is figuring out the job defintions of everyone who works at a newspaper in this information rich world? Maybe since getting the top level of what happens is so easy, everyone should focus on solving a hard problem. Solutions to hard problems usually can be monetized. In that context, is the legacy focus on breaking news a "hard problem?" After Super Tuesday, I woke up and while the coffee was brewing, I clicked on the NYTimes website. They had a great info graphic map showing the results. Then off to work a little later,I saw the printed US Today. They also had the requisite info map. (I assume they had to close around 11:00.) Their map had "Undecided" in the places that I already knew were decided. Fair enough. But what was the thought model that lead to a decision to put it above the fold in the implicit "BREAKING NEWS" category? Does that really make any sense? As I understand it the only people who seemed to get it right on Iraq were a small group of probably very smart people working in the State Department who looked very carefully at public sources of information and spent a lot of time using their experienced judgment to figure out what was going on. No reporters. No secret agents. Makes me wonder why the gezillions of dollars and people hours poured into intelligence and media couldn't do that. If a small number of smart people sitting in a quiet room could produce accurate "actionable intelligence", why couldn't "journalists" and "editors"? They are at least as smart and talented as the folks in the State Department. My take is that because that is not what they are being paid to do. If it's not really your day job, you don't get the time to focus on it. Meanwhile, I would happily pay a dollar if I had the reasonable expectation that I might find out about something I didn't know. I gladly pay for an ever renewing subscription to a print version of the New Yorker, even though I can get it online for free. Imagine how cool it would be if I had a daily newspaper that I could reasonably expect to surprise me, by getting a story in a new way. To do that every day is a very, very hard problem. My take is that would be a significant creation of value that lots of people would be glad to pay for. "Just tell me something, anything I don't know. And tell it in a way that will make it easy for me to understand". Isn't that the job that journalists and editors want to do anyway? Rick, I'm not sure I get the gist of your argument. We should keep PMs alive when no one (11,000 circ in Albuquerque?) is reading them? We should keep them alive as a hedge to 'protect' our morning newspapers? There's an easy answer here: Understand how our audience(s) want(s) to consume information. Give it to them in that form and fashion. That will be print for many. It will be the web for many. Increasingly, it will be mobile - and then devices as yet uninvented. Like my first city editor, the gleeful troll Chuck Capaldo, used to say: We find stuff out and tell people. Even as a city editor of a late, great PM, he most assuredly did not say "Find stuff out and tell people - but only through the medium of black ink on white paper, delivered when we find it convenient." The genies - cable TV, the web, instant, on-demand access to almost any type of news or information - cannot go back into the bottle. There is a healthy future for news organizations that can adapt to that. There is none for those that do not. Thank you for the "gleeful troll" quote. It sounds about right to me. The only thing that you might want to consider is "Find the right stuff, tell it to the right people, in the right form... and get them to pay for it". It is a simple business. Just hard to do.